NEXT season, the British football landscape is going to have to find a new narrative. “Wenger out” has become “Wenger gone”, and therefore a considerable chunk of pundit and supporter dialogue has disappeared. With VAR likely to remove another slice of conversation – refereeing errors – you have to wonder what “your Linekers and Ferdinands” are going to talk about in a few years. As it stands, football has become so predictable that the slightest hint of deviation – Burnley’s seventh place is being treated with no small amount of euphoria – is greatly magnified. Burnley’s achievement is considerable in the age of the uber-club, but this is a team that scored 36 goals and conceded 39 (a total of 75) versus 133 in Manchester City’s 38 games. The gulf is huge. But what does Burnley’s success tell us about the modern game? It reminds us that honest toil and maximising opportunities still have a place in this age of the all-star team line-up. We cling to these moments when the little guy manages to pull-off something remarkable, like Sean Dyche (surely the people’s manager of the year?) and his team did in 2017-18. These occasions keep telling us that football can still spring the unexpected, as we saw with Leicester two years ago. But mostly, the element of surprise is confined to shock results where David beats Goliath, almost comparable to a cup-tie upset. That’s what the Premier League has evolved into. This scenario suggests that outside the top half dozen, which could even be boiled down to top four, the rest of the Premier is somewhat mediocre, hence the level of achievement that earns plaudits is becoming lower. Just 11 points separated Newcastle United in 10th and 18th placed and relegated Swansea City. At the top end, the Premier may have more super clubs than its European peers, but it has rapidly become a closed shop. In the past decade, only 11 clubs have made the top six of the Premier and that bracket has been unchanged for two years and three of the last four, namely, City, United, Tottenham, Chelsea, Liverpool and Arsenal. Interestingly, though, the only club to have retained a top six position over the entire decade was Arsenal. At the same time, although the top positions seems out of reach for most Premier clubs, England has had four champions in the past 10 years – Manchester City (x 3), Chelsea (x 3), Manchester United (x 3) and Leicester (x 1). This doesn’t mean this sort of ratio may still exist in a few years time, when the richer clubs or even more affluent and others run out of options, even though receiving £95 million for finishing bottom, as West Bromwich Albion did this season, does explain why a life of “drudgery” in the foothills of the Premier still has its attractions for accountants and club owners. Shock results aside, the strong will always prevail. Manchester City have the wealth, the world’s most coveted manager and a squad of all talents. They play some incredible football at times and they were head and shoulders above the rest of the Premier. But the most exciting player was undoubtedly Mo Salah, who confounded the sceptics when he arrived at Liverpool. He found a coach who knew how to use him in Jürgen Klopp and the goals never stopped coming. Liverpool have now gone 28 years without a league success, so even those who grew tired of their 1970s and 1980s dominance will not begrudge them a stab at the title, especially with the charismatic Klopp in charge. Although we know that City will strengthen and be even more formidable, we can only hope that somebody, such as Liverpool, runs them closer in 2018-19 in order to make the Premier more interesting. We cannot live on relegation battles alone for our end-of-season thrills. Tottenham, for all their promise, may have peaked with their current team after nine consecutive years in the top six but still no silverware, and Chelsea are going through their usual cycle of management discontent and underwhelming performance. Manchester United, for all their financial clout, have the talent but not the joie de vivre normally associated with the club. Such is the nature of Premier League football, that there’s no guarantee any of the top managers will still be in the same employment by the end of 2018-19 – Chelsea’s Conte looks bound for a Fulham Road taxi and agents are undoubtedly circling White Hart Lane. Of course, even with half a dozen clubs dominating, that’s arguably enough to maintain public interest in the Premier. Certainly, attendances show no sign of falling, the average Premier gate this season was 38,297 – up on 2016-17 and bettered only once in history, in 1949. Surprisingly, 10 of the 20 Premier League clubs saw their crowds fall, albeit by small numbers. The overall league average was boosted by Tottenham’s temporary residency at Wembley, giving them a 115% increase year-on-year. While the Premier had a similar look about it, monopolies are even more embedded in the other top leagues, also a symptom of the development of a European aristocracy. Bayern Munich have now won six in a row in the Bundesliga, but the crowds keep coming, with almost 45,000 per game in 2017-18. Bayern have huge advantages over their rivals, not least the enormous revenues they generate as a club. But in Germany over the past decade, 19 teams have made the top six at some stage, more than any other major league. 12 of those have been in the past five years, again more than the Bundesliga’s rivals. Spain has developed into a three club race in the past half dozen years, with the top three unchanged in that time period. Twice in six seasons, Atlético Madrid have pushed Real Madrid out of the top two and this season, they have won the Europa League. Real’s domestic haul has been less than Barcelona’s during the past 10 years, with Barca winning seven of the last 10 La Liga titles. However, Real are on the brink of a fourth Champions League in five years, demonstrating where their true focus lies. Real, and indeed, Barca, will have a problem soon when they start to talk about life after Messi and Ronaldo. Likewise, Paris Saint-Germain may also have to deal with the loss of their own talisman, the mercurial Neymar, who may not be too happy in the French capital. Back on top this season after relinquishing their Ligue 1 title in 2016-17, PSG scooped the treble but disappointed in Europe. They’ve scored over 100 goals and with one game to go, have won 29 of their 37 games. They are impressive champions, but after spending so much on Neymar and Mbappe, the margin of their success doesn’t seem much different than two years ago when they scored 102 goals, won 30 games and notched-up 96 points. This raises questions about how much money you don’t you need to spend to win Ligue 1? Of course, the PSG project is about European success – how long will they have to wait? Juventus must also wonder what they need to do to secure the cherry on the top of their own cake. Serie A winners for the seventh consecutive season, Juve fell short in Europe at the hands of Real Madrid, going agonisingly close to turning around what looked like an insurmountable first leg defeat in the quarter-finals. Juve were run close by Napoli this season and their squad may need some reinforcements for next season, but it is difficult to see anyone knocking the Turin giants off their pedestal, despite a consistent top three of Juve, Napoli and Roma. How Italy could do with a revitalised Inter and AC Milan! If the top domestic leagues have a “business as usual” look about them, the Champions League is starting to have a certain weariness about it. If Real Madrid beat Liverpool in this year’s final, it will be seven of the last 10 in terms of Spanish winners of the competition. The Europa League is similar – Atléti’s win makes it six of the last 10 for La Liga. Let’s not be uncharitable, though, the continent’s top clubs have given a lot of pleasure, many hours of fine football in 2017-18, but people, eventually, get bored of routine. The problem is, football and society have created a product that has become incredibly wealthy, one that has become very self-perpetuating. The clubs that stand astride the game today will take some effort to dethrone. It may never happen. The only way a new, genuine challenge will come is for the next batch of pretenders to scour the rich lists and go in search of the world’s wealthiest men and women to provide the financial impetus that elevates them to the next level. Organic growth is never going to compete with these giants of commerce and football, hence people are performing cartwheels about an honest, mid-range club finishing seventh and earning the right to play in Europe next season. 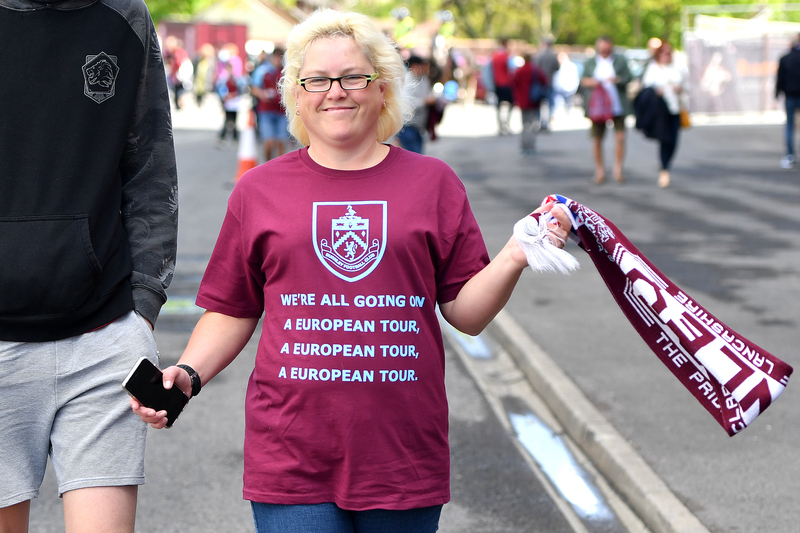 One thing’s for sure, Burnley will not treat Thursday night football as an inconvenience. Football is a two-speed economy, but more equality can be introduced if the extremely wealthy just play among themselves while the rest can go on competing against teams in their own socio-economic group. Surely the prospect of some success is better than forever looking up at the same flat-track bullies vaccuming-up the best players, the most lucrative sponsorship deals and the only silverware on offer? Some might say that a European Super League will devalue the core domestic product, but frankly, is football not already a deeply divided society of winners and losers? Next season’s title winners: Manchester City, Paris Saint-Germain, Bayern Munich, Juventus and Barcelona. Or was that this season? Previous Entry Guest Slot: Should Russia be hosting?